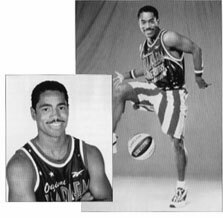 A native Peorian and 1982 graduate of Peoria High School, Johnson played for 17 seasons, from 1988-2006, for the internationally renowned Harlem Globetrotters. Performing on all seven continents and 77 different countries, Johnson inherited the role of dribbling wizard made famous by Marques Haynes and became known as "The World's Fastest Dribbler." 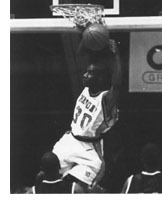 He attended Spoon River Community College and graduated from Loras College, where in 1999 he became the first alum to have his uniform number retired. He played in Peoria in 1990 to the delight of hometown fans. Among his highlights were playing in front of Pope John Paul II, Mother Teresa, and Nelson Mandela.